I can’t say it’s a Safari 4 feature, I tested Firefire 3.5 beta, they can achieve it. But it definitely fixed a serious problem in Safari 3. If you have tried some resource killing web site, e.g. HD flash movie page, Facebook games like Restaurant City, you will find the CPU usage can be pushed up more than 100%, if you have dual core processor!! And my MacBook Pro can be heated up to 88 degree Celsius (why I hate Flash!). The worst is if you only a new tab and browsing page or even minimize Safari 3 into Dock, the CPU usage is still high as before! Dropbox – Enjoy the space! I think I registered once Dropbox has released. It becomes part of my imaging workflow. I delivers photos to my friends, share everything with my girl friend with Dropbox. The biggest benefit of it is they have both web interface and client. I always told me friends to install client if they need to download many large files. And if they located in somewhere can’t have client installed, web interface is perfect channel for them to get the files. And it has iPhone browser interface as well! Web interface is simple and clear and providing versioning as well. After installing client, it would synchronize all the files from Dropbox seamlessly. I don’t know how new it is. But when I just come across flickr today, I found it allows to upload video now. I’ve tried it, the compression quality is much better than youtube! And I like it so much that it will become a single platform for me to publish photos and videos!!! GREAT! Bloggers, be aware of your health! I’m so happy as a wordpress user. It’s free but they keep improving the blogging facilities from time to time. The update each time is so significant. 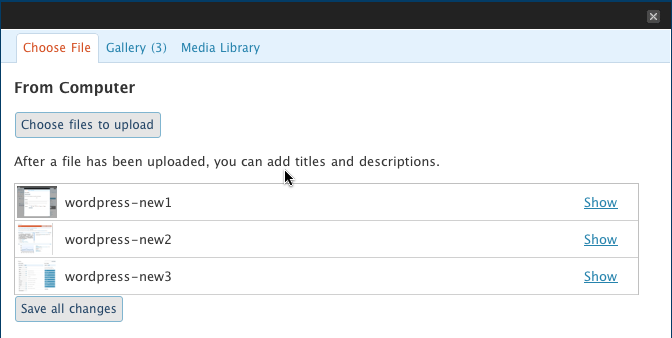 New rich text editor supporting Safari and new layer to manage media files. 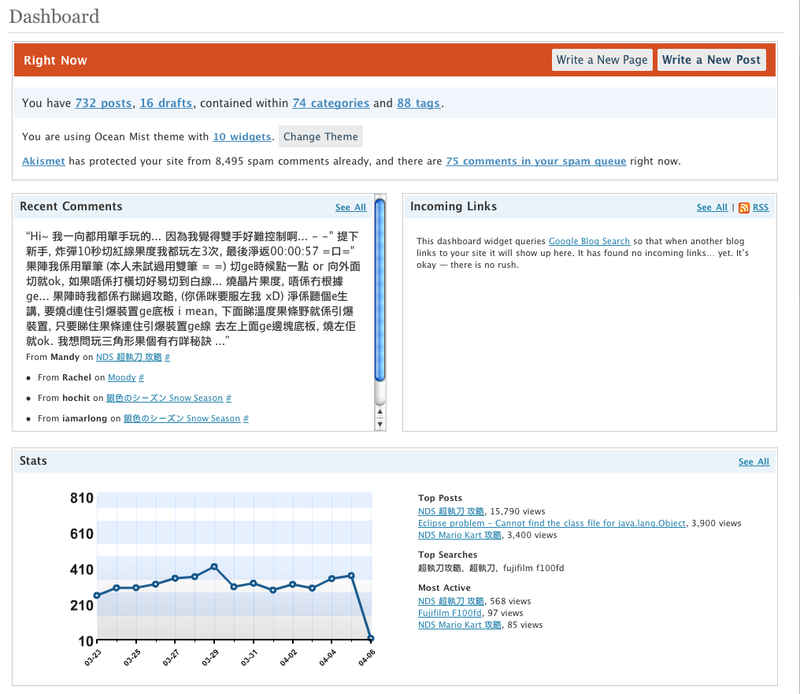 Media can be arranged and be showed as gallery in your blog with new tag “gallery”. 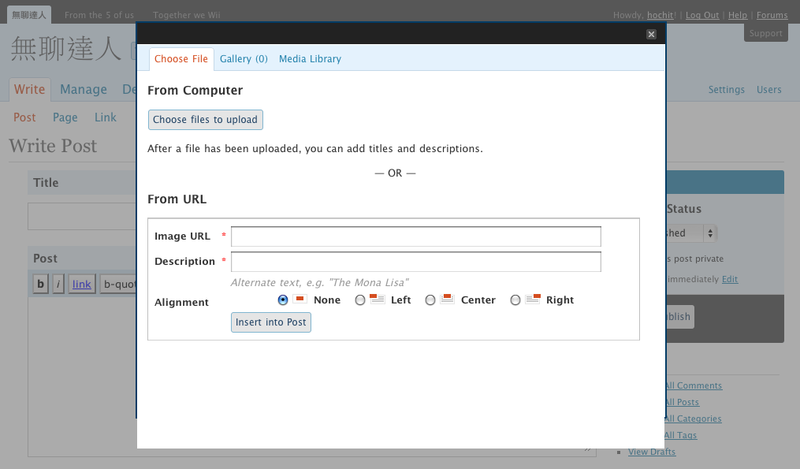 Now also supports uploading multiple file with AJAX interface. New design dashboard loading much faster and more informative. 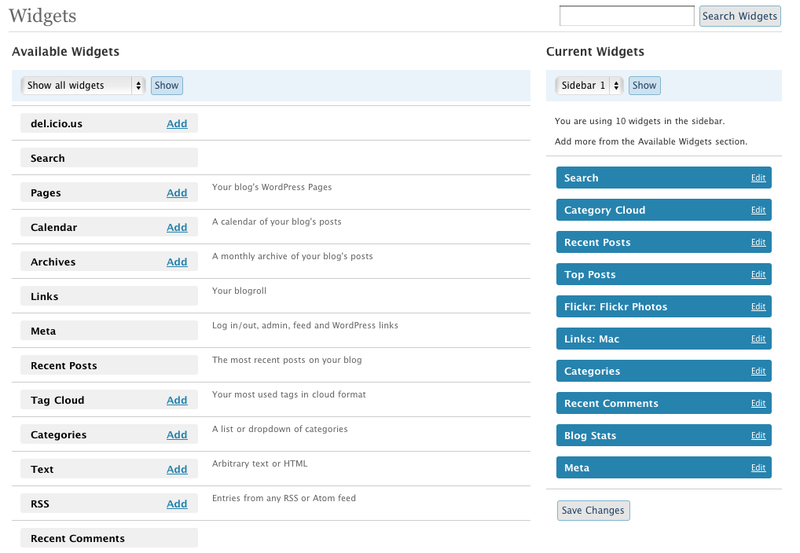 New design widget management layout also supports Safari now!